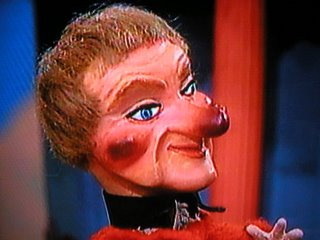 Lady Elaine Fairchilde from Mr. Rogers Neighborhood on PBS scared the crap out of me as a kid. After doing a little research it is comforting to learn that many kids between 1968-2001 were freaked out by this beast of a puppet voiced by Fred Rogers himself. Why the freakish red cheeks and nose? Why that horrendous Beatles hairdo? Now that I think about it, all of those damn puppets freaked me out. The best part of the Mr. Rogers show was watching Mr. Rogers change into his comfy cardigan and slip on his sneakers and the sweet-sounding intro and outro songs. Honestly. Every time he stepped into that Neighborhood of Make-Believe my stomach would hurt as anxiety would set in. I don't recall if she scared my kids, but her ugliness reminds me, of me. Poor thing. I tend to scare young children, too! Lady Elaine eventually had to go to the neighborhood of rehab for help in treating her alcohol and cocaine addictions. yeah, I used to think it was some type of burnt puppet. Scare me more than King Friday. BTW...made you blog of the day. I TOTALLY agree with Will. Dr.Smith working at his *other* job. A lot of those old characters were kind of creepy. Chucko and Bozo the clown always freaked me out. I still have a thing about clowns and always hated the circus because of them. This is hysterical as I came across your blog when looking for a photo of her telling a friend of mine she freaked me out. I'm glad I wasn't alone. I'm still scared of her & may have nightmares tonight. And why was she always saying "toots"? Shudder. Oh, how I shudder! She was bet passive-aggressive & manipulative. I could sense that, even as a small child. Look up Lady Elaine Fairchilde's "You Will Not Go" on YouTube and prepare to be especially freaked out!